As consumer concern for healthy eating escalates, so does the interest in natural and artisanal foods. Artisans can keep traditions alive by going beyond the mass-produced norm with the best ingredients and old-world methods to create foods with flair. No question, artisan foods are popular. From the increase in small, niche names in specialty shops to big, iconic brands on supermarket shelves and the surge of food prep-at-home delivery businesses, artisan food companies seem to be thriving. All of which begs the question: What is artisanal? Hand-crafted breads, pastries, chocolate, cheese and other foods are frequently defined as artisanal -- having authentic, natural qualities that mix fine, fresh ingredients with passion on the part of the artisan, who puts his heart and soul into what he makes. Changing consumer tastes and preferences for natural, healthy foods have contributed to the rapid surge in artistically made products. These foods usually have cleaner labels, which plays to the current obsession people have with food. Based on the Italian word artigiano, artisan originally referred to a skilled craftsman who carved or otherwise hand-tooled an item. "Natural" in the food world typically means food with few if any preservatives and artificial ingredients and minimal processing. But the term "natural" still is not defined in the U.S. by the FDA or the USDA. So don't look for the two agencies to weigh in on "artisanal" any time soon. However, no one can ignore the increasing numbers of consumers searching for more food transparency. According to a survey from Packaged Facts called "Nutritional Labeling and Clean Labels in the U.S.: Future of Food Retailing," 87 percent of Americans "at least sometimes" check the Nutrition Facts panels on packaged foods and beverages, while 56 percent actively look for nutritional information and guidelines. Does artisanal also mean natural? 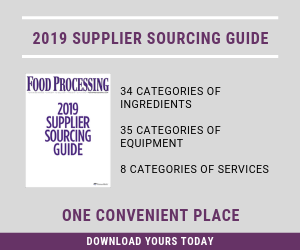 Food makers, distributors, ingredient suppliers and marketers have come up with their own definitions, and there are plenty of disparities among them. For bakers like La Panzanella, artisan generally means staying true to the ingredients going into the product. "For us, it's food made in, or close to, the traditional way with simple, understandable ingredients, from a family recipe or a recipe that has been handed down -- food that people will remember and want to share with family or friends," says Steve Lorenz, director of marketing. Located near Seattle, La Panzanella bakes classic, savory Italian crackers and sweet, seasonal artisan cookies using fresh, "clean," local ingredients and natural flavors. "All of our products are both artisanal and natural," he says. "We do use some automation, but stay as true as possible to the original way our crackers were made. We still bake crackers mostly to-order, maintain fairly simple ingredient statements and our products are still touched by human hands as part of the process." Mark Eisenacher, senior director of marketing at Back to Nature, Naples, Fla., thinks about his company's products as an artist would think about a painting. "In that way, the products are artisan, despite being mass-produced," he says. Back to Nature's wholesome granolas, cereals, cookies and soups incorporate simple ingredients as well as the functional benefits of protein and fiber. Eisenacher says artisanal doesn’t have to stand for handmade or natural. "What it does stand for is the intent to develop and deliver a uniquely differentiated product that's desirable to certain consumers." Nielsen-Massey Vanillas, Waukegan, Ill., a 108-year-old, third-generation family-owned producer of vanillas, flavors and aromas, uses the same recipes and production methods it has used since its inception. Although it possesses high-tech manufacturing facilities in Illinois and Leeuwarden, Netherlands, "We believe in a fairly traditional definition of artisan, that it applies to high-quality products made often in small batches, using traditional methods," says CEO Craig Nielsen. "For our customers − many of whom are foodservice professionals looking for the best possible ingredients − the most important words are quality and tradition." One of Nielsen-Massey's most popular offerings is Madagascar Bourbon pure vanilla bean paste, favored by many artisanal ice cream and candy makers, bakers and pastry chefs for its rich, creamy flavor and thick consistency. To Naomi Novotny, president of SaltWorks Inc., a gourmet wholesale and retail supplier of more than 110 varieties of specialty sea salt from around the world, artisan means a product that's hand-crafted with attention, patience, expertise and care. "All of our salts are hand-tended and cold-smoked, with untreated, carefully selected woods, and no artificial flavors or colors," Novotny explains. Located near Seattle, SaltWorks does use high-tech quality control and packaging procedures, such as optical color sorting, high-speed container filling and low-temperature drying, but its harvesting, smoking and flavoring processes involve great human care, which allow its offerings to be considered artisanal, Novotny says. "This is extremely important to us, and we partner with hand-selected companies that adhere to strict guidelines. We have perfected many proprietary artisanal practices to offer the highest quality and widest selection of all-natural salts anywhere." Many foods bearing the artisan claim are hand-crafted; however, not all that are labeled artisan deserve the credit. Some food and beverage marketers and makers weave the word into promotions and use it with perhaps a broader connotation than its strict definition. Indeed, everything from beer, ice cream and pastries to pickles, pancakes and pizza has been described as artisan to promote quality and distinction. But are products such as Haagen Dazs ice cream, Prego Three Cheese Alfredo Sauce, Dunkin Donuts' artisan bagels and Pillsbury's refrigerated Whole Wheat Artisan Pizza Crust dough really artisan? Some large-volume companies using artisan terminology "may be clouding the meaning, making it difficult for smaller companies to compete," says Argie Liarakos, general manager and vice president of operations at Artisan Specialty Foods. The Lyons, Ill.-based supplier of domestic and imported cheeses, sausages, charcuterie, nuts, fruits and other pantry items serves discerning restaurant chefs, foodservice operators and fine dining restaurateurs in the Chicago area who create specialty products by hand. It also distributes fresh bacon processed entirely on one farm from start to finish. Liarakos says he doesn't think automated technology and high-efficiency food production should enter the conversation. "Artisan foods are hand-crafted by small food producers in small batches, where they can control the quality as opposed to [large] volume and [large] quantity-type mass manufacturing. Artisan also means making unique foods and keeping a food tradition alive. Even though a product might start out artisanal, technology can alter the original product, and I'm not sure you can get around that." Louise Kramer, public relations director of the Specialty Food Assn., New York, says many big brands are adopting the word artisanal because it evokes the sentiment that there's a real person behind the product, an actual “artisan” who is personally making the food, or at least has had a hand in it. "Artisan foods and natural foods are distinct terms that are not confused," she says. "Natural evokes unprocessed, plucked from nature. Artisan has the person behind it, crafting the food. The prized younger consumer is skeptical about product claims, and will surely view 'artisanal' claims from mass-producers with a grain of sea salt. We are seeing major growth in specialty food, which as a category embraces artisanal food," Kramer continues. "Sales reached a record $109 billion in 2014, and continue to outpace tepid growth of conventional food sales. Supermarkets are changing their product mixes to include more artisanal items. They are prized by retailers because consumers are willing to pay more for quality they get from such truly specialty versus mass-market items." So can artisanal foods be produced automatically? Nielsen says the process really has to be authentic. Like SaltWorks, while elements of Nielsen-Massey Vanillas' production certainly have become mechanized over the years (bottle filling, temperature monitoring and labeling, for example), there's human interaction across all aspects of production. The company's vanilla beans, for example, are still inspected by hand, bundle by bundle, and the extraction process takes weeks to complete instead of days, in order to achieve the best quality and flavor. "We still use this method because it produces the very best final product," Nielsen says. "With the advent of many new technologies, there are ways to incorporate them into the process and still maintain traditions. But we're not willing to compromise on quality for the sake of higher production numbers. Only someone who has gone through extensive training knows when our cold extraction process is complete and when an extract is ready to be bottled. It's this human element that keeps the artisanal quality in our products." Eisenacher agrees that artisanal foods' association with hand crafting and authentic processes shouldn’t rule out food processors from using the term. "For Back to Nature, artisanal is connected with our mission to provide people with truly flavorful, wholesome foods made with simple ingredients," he says. So-called natural food, made of five or six unadulterated ingredients, has been selling well across nearly every market segment. However, Eisenacher says natural and artisanal are different things. He defines natural as referring to the source of ingredients while artisan refers to the creation of the final product. "Natural is a challenging word in processed/packaged food, but that doesn’t mean processed/packaged food [can't be] natural," he says. "We take all sorts of select, premium ingredients and develop unique recipes — again, much like an artist. Those ingredients are natural. There is definitely an overlap." Artisan products require time and care, adds Liarakos. His company considers many of the products it's associated with both artisanal and natural. "If a product is truly artisan, it's likely it will also be a natural product, but not all natural products are artisan," echoes Nielsen. Although natural ingredients and artisanal products may be simple, they frequently present more sophisticated tastes with more dimension. Ardent Mills, Denver, supplies sprouted whole wheat flour and organic whole wheat flour, ancient grain flours and grains to artisan bakers to fulfill the needs of "enlightened eaters." Likewise, inclusions and toppings like blueberries are often used in artisan foods as demand for wholesome, natural fruits has been a big hit. Blueberries not only taste great, they have antioxidant properties, says Thomas Payne, industry specialist for the U.S. Highbush Blueberry Council, Folsom, Calif. "Blueberries can sweeten and color a product naturally, so fit in well with natural and artisanal products," he says. Artisan and natural foods live on the premium end of the spectrum, so keeping up with demand can be tricky and expensive. Many time- and labor-intensive artisan methods carry upcharges for top-quality ingredients, freshness, distribution and labor. Artisan is increasingly being used in the marketing of foods, more precisely, specialty foods. 'Artisanal', 'handmade' and other adjectives can expose you to class action lawsuits.